Effective training for a distance cycling event follows a systematic plan. We present two examples: an 8-week program and a 15-week program. It’s show time! All your hard work in training and preparation is done. Now relax, take it all in, and have fun. For a successful ride pay attention to these key things. Everyone from experienced distance cyclists to those preparing for their first century ride will benefit from the training advice and strategies featured in Distance Cycling. Lead author John Hughes, one of ultracycling’s most respected names, helps inspire riders of all ability levels through practical advice for centuries, brevets, and more. Century, brevet, cross-state, ultradistance—there is only one book that covers them all. Distance Cycling is a comprehensive guide for planning, training, and competing in long-distance events. Long-time distance cycling great John Hughes, an endurance coach and sport science expert, and coach Dan Kehlenbach team up to cover the sport from every angle. Combining sport science, including the latest research on training and conditioning, with hands-on advice for planning and performance, Distance Cycling will ensure you get the most from every ride. You’ll also learn how to fuel properly before, during, and after events; how to select the best equipment for your ride; how to perform basic roadside maintenance on your bike; and how to avoid the most common injuries in distance cycling. John Hughes has been an endurance cyclist since 1975, spending 15 of those years as a coach and trainer. For 12 years he served as the managing director of the UltraMarathon Cycling Association (UMCA), the founding organization of the transcontinental Race Across America (RAAM). As UMCA director, Hughes developed the popular century challenge, encouraging cyclists to ride 100 miles every month. Hughes has twice competed in RAAM and has twice won the Furnace Creek 508, a 508-mile RAAM qualifying event. Among his other accomplishments are seven 1,200-kilometer randonnées, including a course record for the Boston-Montreal-Boston route. For 10 years Hughes organized and led supported tours of the West and Southwest. He also explored the West on self-supported tours on a loaded touring bike. Hughes has been certified as a USA Cycling sport coach and a National Strength and Conditioning Association personal trainer. Hughes has coached numerous riders, from people preparing for their first centuries to dozens of top RAAM finishers. He lives in Boulder, Colorado. Dan Kehlenbach has been coaching cyclists and other endurance athletes since 1995. He has certifications through USA Cycling as a level 2 coach and the National Strength and Conditioning Association as a strength and conditioning specialist (CSCS). He earned his master’s degree in sports medicine from the United States Sports Academy in Daphne, Alabama. Kehlenbach spent four years with the U.S. Coast Guard, serving as the strength and conditioning instructor for the recruit training program in Cape May, New Jersey. He also represented the Coast Guard in cycling races, duathlons, triathlons, and running events. As a contributing editor for UltraCycling, the official magazine of the UMCA, Kehlenbach wrote numerous articles on training and conditioning, specializing in articles that demystify the complexities of sport science. "My good friend, and ultracycling guru, John Hughes, has produced the ultimate book on what a cyclist needs to know when considering a ride of more than 100 miles." "Distance Cycling has great information on conditioning and nutrition, and it's full of detailed week-by-week cycling training programs for various distance goals. Best of all, it's written in an enjoyable, easy-to-read style. 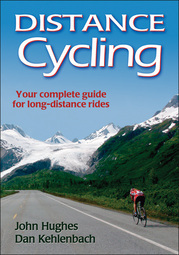 Without a doubt, it's the best book I've read on long-distance cycling."